January 15, 2011 Dan O. Now instead of a dog and a cat that I have, I want a dragon. As the son of a Viking leader on the cusp of manhood, shy Hiccup Horrendous Haddock III faces a rite of passage: He must kill a dragon to prove his warrior mettle. But after downing a feared dragon, he realizes that he no longer wants to destroy it. So, he befriends the beast — which he names Toothless much to the chagrin of his warrior father. This film was probably one of the biggest surprises of last year. Jeez, now I can say last year, whenever I talk about 2010. Anywho, this film grossed about half a billion dollars at the box office, and was one of the best-reviewed films of the year. Never would have I expected that from an animated film starring Gerard Butler, and Jay Baruchel. The screenplay is what took me by surprise with this film as it has a decent amount of good comedy, but the dramatic depth is what really takes you over. There is a montage in this film that is used with no dialogue, and it really does tug at your heart. Showing you that sometimes no words spoken at all, can sometimes be the most effective. The film has a message about being pro-animal and how we should treat all species with respect, but they don’t hammer us with that message, and it feels fresh. However, it’s the visuals that take over this film. There are plenty of flying scenes that will strike you in awe, as you are taken on this beautiful, fun ride, and the visuals are just breath-taking. It looks pretty, but it also has the action to back it up, and keep you watching, and sit in amazement. The only problem I had with this film was that it just wasn’t as memorable as I was expecting it to be. Yeah it’s got a good story, and awesome visuals, but will I be buying this for my kids 20 years from now, telling them about my experience with this movie as a kid? No, and it is very good, just compared to other DreamWorks animation films it’s not as good. Jay Baruchel‘s nerdy, awkward-voiced way of delivery actually is works here, and his character is a your typical softy, but a lot of the timing from his delivery, brings out a likability within his character. Gerard Butler is actually in a film that doesn’t blow! He plays the viking father, with his native Scottish accent, and does a good job for once. Wish I got to see more of this, but something tells me I shouldn’t get my hopes up. America Ferrera doesn’t really have that many lines in this film, but her character is strong, and we think shes actually pretty cool. Others in this film are Craig Ferguson, Jonah Hill, Kristin Wiig, and McLovin. 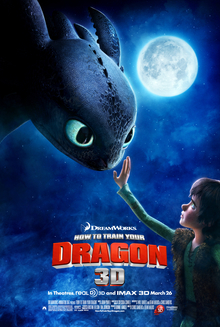 Consensus: Although not as memorable as other animated films that have came out in the past couple of years, How To Train Your Dragon still impresses with its great story, that has effective emotional depth, and enchanting visuals, that keep you watching. Not a bad review. I actually have this in my que. Just haven’t had the time to post it, yet, but I will soon. Keep up the good work, man! Thanks dude, def check this one out! I liked your review of this movie very much. Overall, I felt it was concise, clear and well thought. I love your blog…You Go Boy ! that Toothless is the cutest character since Stitch from Lilo and Stitch, which was directed by the same dude i think.. He was, even though he didn’t speak. Oh I know what you mean! They did, but that didn’t bother me as much. The people looked so ridiculous though. I think this is one of the best animated films of 2010. Loved your review, and as soon as I get around to writing my own, i’ll link to this one! I hope they make a sequel or something to this, because I can see this being a great little franchise! It could make a great franchise, but its not better than Toy Story 3 that’s for sure. I think it’s memorable enough to live up it’s esteem, that’s why HTTYD is still my 5 point 5 star rated film.